Managing Director of the Bolton Eagle Spinning Company Ltd, Eagle Mills, Bolton and Director of Winder and McKean Ltd, cotton spinners. He was the son of Walton Ainsworth JP and was born into a family with a long history of public service. When Liverpool Corporation were granted rights of compulsory purchase in Rivington, the Estate comprising Beech House, Top o'th' Meadow and Middle Derbyshire, along with 21 acres of land, was sold for £11,000. During this period he lived for a few years at Ridgmont House, Horwich. During his year as Chairman, on 5 November 1919, William Job Slater, Vice Chairman, unveiled a portrait of Councillor Ainsworth in oils which had been paid for by officials and members of the Council. He also unveiled a portrait of Thomas Hampson, a local historian. In 1920 the cotton mills founded by his father and uncle, Walton and Charles Ainsworth, in Weston Street, Great Lever were sold to Crosses & Winkworth. In January 1930 he was elected as a Conservative Councillor for Bradford Ward in Bolton. He was also a Magistrate. He was a Governor at Rivington and Blackrod Grammar School and was largely responsible for the foundation of the local Junior Unionist movement. On his death he left £23,389, £16,689 net. 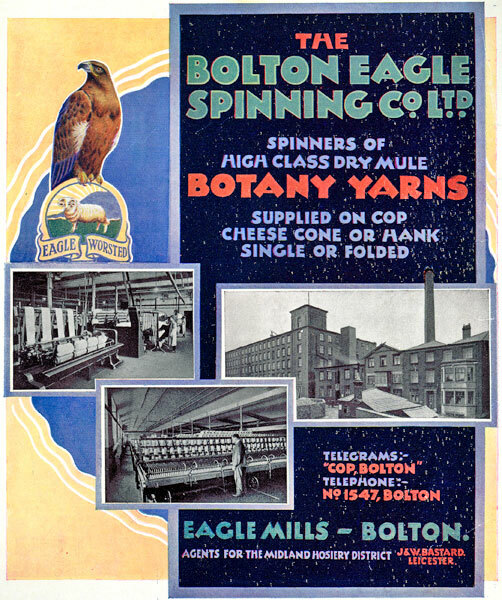 Advertisement for the Bolton Eagle Spinning Company Ltd.